The friendly market town of Rhayader is the oldest town in Mid Wales (5th Century)and lies equi-distant from Hereford to Aberystwyth on the west coast, and from Snowdonia in the north east to the Brecon Beacons and is only 13 miles from the Royal Welsh Showground in Builth Wells. The Wye Valley Walk runs through the town, passing the Town Clock on the way. The town has its own leisure centre with swimming pool, solarium, gymnasium, and squash courts and houses the local tourist information centre. There are two banks, shops, chemist, churches, pubs, restaurant, pottery, crafts, antiques and the town is home to the Welsh Royal Crystal factory. There is a link just outside the town to National Cycle Routes (Sustrans 8 & 81). The Elan Trail, an impressive route from Rhayader, takes you through beautiful countryside (via the Lodge) and leads to the lakes and dams. 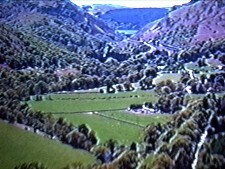 The Elan Valley Estate with its spectacular changing scenery of lakes, mountains and moorland covers approximately 70 square miles of countryside. There are several Sites of Special Scientific Interest (SSSI) and Environmentally Sensitive Areas (ESA) and nature reserves. Due to non-intensive farming, the valley is richly endowed with many different species of flora and it is worth following the botanical trail published by the Elan Valley Ranger Service. In the early 19th century the poet, Percy Byshe Shelley stayed in the valley at Nantgwillt House and at Cwm Elan House (both now submerged under Caban Coch and Garreg-ddu reservoirs). The remains of the walled garden and little bridge of Nantgwillt House can be seen when the water levels drop in dry spells. At other times the dams are a sight to behold when the water is cascading over. 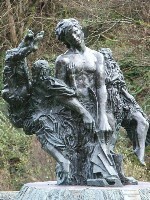 A wonderful bronze statue depicting Shelley is situated in the grounds of the Elan Valley Visitors Centre.